Download the Scores in XL, after all 16 races. 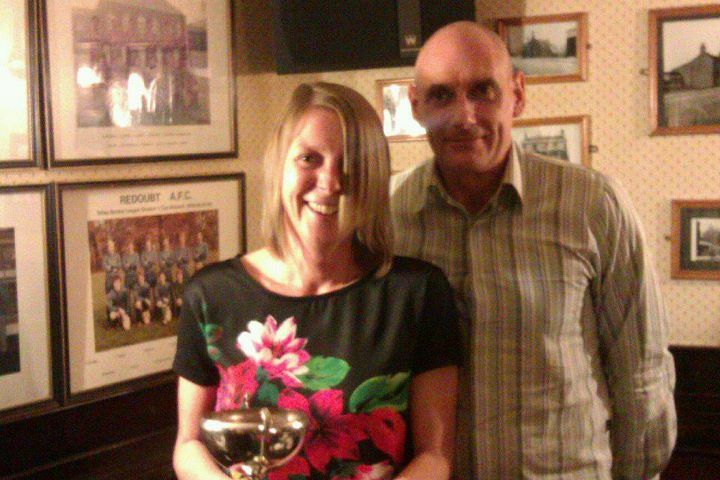 The 2011 Distance Runners Club Championship winners were :- 1st Chris Ward, 2nd Paul Robinson, 3rd Neil Dutton, 4th Peter McNamara, 5th Richard West, with Joanne Biltcliffe being awarded the trophy for 'Most Improved Runner', and Paul Robinson the trophy for competing in the most events. 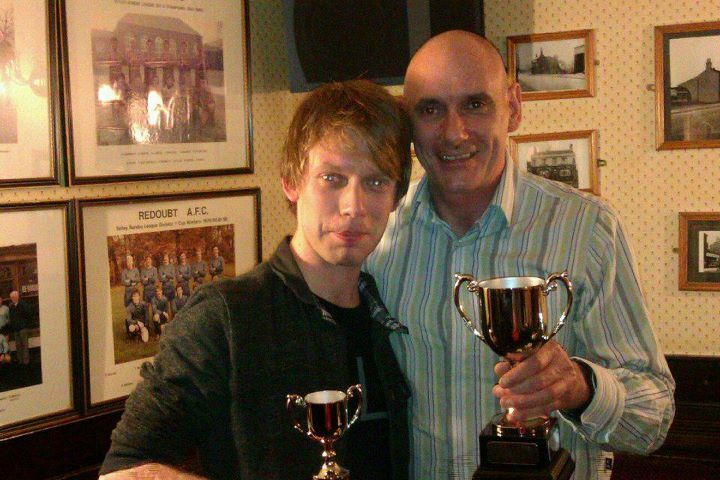 Chris Ward and Joanne Biltcliffe receiving their trophies from Alan Slack. For the 2011 Distance Runners Club Championship there will be 16 chosen events, with the best 8 races to count, which must include a minimum of 1 multi-terrain or cross country race. Runners who complete more than 8 races will forfeit their lowest score, unless their lowest score is for a multi-terrain/cross country race. There will only be one mixed Championship table, with prizes awarded to the top 5 scorers irrespective of gender, once the series has been completed. Runners must enter the races as a Wakefield District Harrier, and must be registered with England Athletics. Points will be awarded as per World Masters Association WMA06 tables (% x 10) as per the website www.runbayou.com, with multi-terrain/cross country amended to take account of terrain and conditions underfoot, as described later. The points are scored according to an age and gender graded table, which will tell us, for example, whether a 37 mins 30 secs 10K time for a 48 year old male is better than 40 mins 30 secs for a 30 year old female. Proposed races are subject to change, and may be substituted with other races if they clash with more important events, such as the championships and relays that Wakefield District Harriers & A.C. participate in. In order to take account of wide differences in terrain and conditions underfoot the following scoring method will apply. Take the time of the runner 10% down the field and get WMA points for a senior male for this time. If these points are “x” then the multiplier for all other race points is 693/”x”. (24 recent flattish local road races of varying distances from 5k to 1/2 marathon averaged 693 WMA points for the time of the runner 10% down the field, measured as a senior male.) Very occasionally, if rogue results occur, the points multiplier might be tweaked a little to give results more in line with norm for consistent runners. Tony Smith has agreed to-coordinate the results for the championship, and the championship results table will be added to this page after each race. Tony can be contacted on tonywilliam@smith70.fsbusiness.co.uk for any queries about results, or suggestions for future events for the championship.